The Eldir: DSO application is the brainchild of Adriaan Heijns, a well-known professional in the security industry, and ITC industry veteran, Denis Bensch, who leads the Eldir: DSO product development and innovation team. The unique application is built on the battle-tested FlowCentric Processware platform and is designed to address many of the costly challenges faced by security companies. Assets, contracts and personnel are better managed with Eldir: DSO, concur both directors. The system is built on the powerful process optimisation platform from FlowCentric Technologies, and created in conjunction with industry specialists to provide a truly remarkable solution to customers in both private and public security industry. Eldir: DSO helps organisations to save money by enforcing operational efficiency. Inefficiencies can be caused by errors or fraud in time-keeping, attendance, or shift reports, which then lead to excessive payments, legal disputes, and expose the company to numerous other risks, including reputational damage. The application enables customers to accurately track assets while they are in the field, explains Bensch, CIO of the FlowCentric Group of Companies. Eldir: DSO also manages qualifications, such as driver's license and firearm competencies, in a proactive way, ensuring these credentials are accurately recorded and renewed in time. "Eldir: DSO is completely unique. We have yet to find another product in the market capable of accomplishing all that Eldir: DSO can," states Heijns, CEO of Eldir (Pty) Ltd.
Heijns explains that with paper or spreadsheet-based systems, it is virtually impossible for an organisation to accurately establish how much each security officer costs the company, how much each officer makes for the company, or how much profit is lost as a result of administrative errors. Bensch reveals that Eldir: DSO was built on FlowCentric Processware, because the versatile business process management platform is well-suited towards integration with third- party systems. "Where FlowCentric Processware has traditionally integrated with ERP and other line-of-business solutions, we are now using the platform to integrate with security-related IoT devices. This extension from the cyber world to the physical world provides us with enormous benefits"
"By marrying these two worlds, we can keep track of a security company's most important, and most expensive, resource, the security officer. We should call it IoSO, Internet of Security Officers," grins Bensch. "In such an enormously competitive industry, early adopters of new technology often take such a huge competitive leap forward that rival companies struggle to catch up," states Bensch. Not only are these companies able to save money and drive down their rates, but their service delivery improves, and they are able to maintain customer contracts for longer, adds Heijns. Visit the Eldir (Pty) Ltd website for more information. 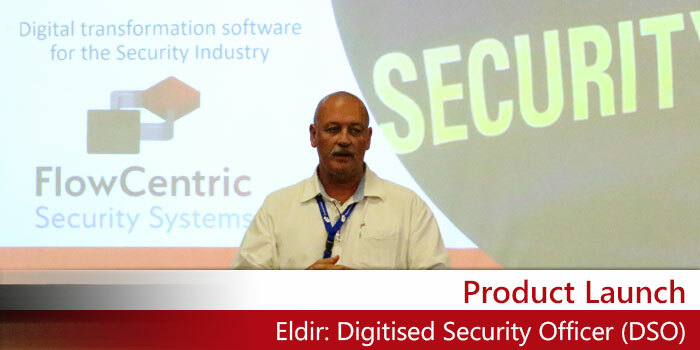 Eldir (Pty) Ltd is a registered FlowCentric Technologies ISV Partner. Registered Partners use the FlowCentric BPM Software to neatly package their intellectual property and sell the resulting solutions into their respective markets.